Yours received and noted. Was sorry to hear you had no photo of your dear little boy. Can sympathize with you & your husband in your affliction. Am glad to hear you have a kind husband & a comfortable home & good health. We must not think to[o] much of our affliction & more of the infinite blessings bestowed on us by our heavenly Father. I am well & try to be thankful for the great blessing of health. Our summer so far has been something warmer than last but I am now acclaimated & get along very well. We have had splendid rain here of late but sometimes too long between showers to be good for vegetation. Have got 4 nice lots in one block, all fenced with wire & 5 gates on it. My Calhoun lot, which gives me the corner lot on Arkansas & Tenth St., it & house on it is making me $5.00 per month right along & tis so nicely situated & such a healthy locality. It has a tenant & 6 or 8 houses in sight not rented at all. Have just finished planting sweet potatoes. They plant the vines off the early ones, cut them about 6 in. long, & stick [them] in the ground & they grow. In regard to churches, we have an E[piscopal?] church & Baptist already completed so far. They hold services in them , but Presbyterians are not numerous enough as yet to build. Some good preaching we have. Oganizations, we have the GAR’s Ladies Aid Society, Christian Endeavors, and others to[o] numerous to mention. Our school house [is] a 2-story frame. Will be ready for the young [illegible] to start pretty soon. Our jail is up, already for roofing. I guess we won’t need it much as long as we have no saloons & I hope that won’t be in my time. This century-old sympathy letter from my Great-grandfather Robert Patterson Gray (1844-1928), living in Lynn Haven, FL, to his newly married daughter back in Pennsylvania, who has just lost her first child, reveals a man of great faith and compassion, but also industry and virtue. Unfortunately, as of this writing, I only have the first five pages of what must have been a longer letter. Perhaps the remainder of the composition will turn up in the future. I am indebted to cousins Janet Kellar Hull, who has preserved the letters and artifacts of Great-grandfather, and Dr. David Gray with his wife Phyllis, who have provided a summary of the materials. You can follow my Gray Family scans, transcriptions, commentary, and postings from “Table of Contents: Gray” on “Our Gray Family Tree,” or by clicking on the new widgets to the top right of this page, or by dragging your cursor down over the “Gray” surname in the top toolbar to the “Table of Contents” then moving it right to “Descendants of Robert Gray,” then right and down to the article you desire. We’ll look at the general purpose of the letter in a moment, but first, let’s consider some of the other particulars. Although we don’t have an envelope for this letter, the postmark is surely Lynn Haven, Florida, where Robert had been for at least two years. He is eager to annouce to his daughter back in Western Pennsylvania all the real estate construction and improvements he has been witnessing: houses, churches, social organizations, a school, and even a jail. He’s quick to point out that there’s no saloon yet, and this staunch, conservative Presbyterian hopes there won’t be one in his time. 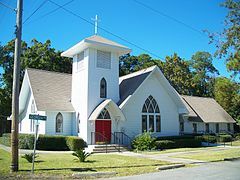 Though Robert relates that, “Presbyterians are not numerous enough as yet to build,” research indicates that the First Presbyterian Church of Lynn Haven is now one of the town’s most beautiful landmarks. He boasts, “Some good preaching we have,” and by 1915 Robert transfers his membership to that congregation from Bull Creek Presbyterian where he had belonged and in which he had been baptised and married. Did he intend to stay in Florida, considering that his family and farm are back in Pennsylvania? Robert won’t return home to his wife and farm for another eight years, and we may never know why, but for now, he’s literally heavily invested in the new sunbelt that is Florida. He even provides evidence that, where he is at least, “a healthy locality,” Florida can be more comfortable weatherwise than Pennsylvania. It just takes what he calls “acclaimation.” It sounds as if Robert is landlord to one of the country’s first gated communities: “Have got 4 nice lots in one block, all fenced with wire & 5 gates on it.” Apparently, these properties, when occupied, are returning $5.00 per month, he brags. And there are others within sight that are waiting to be rented. We’ll learn through later letters that Robert will continue his property investments and even open a store in the community. Also, he spends his free time farming. He mentions sweet potatoes in this letter, but later he tries his hand at corn, potatoes, and even citrus fruits. 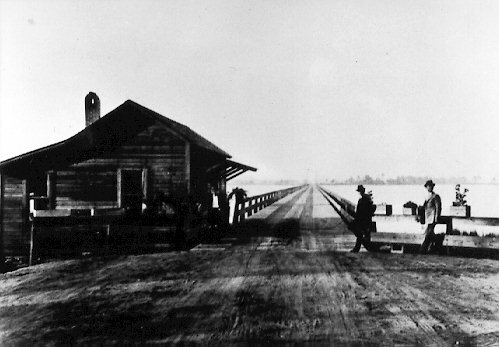 Lynn Haven, Florida, where Robert was living, according the their new “Online Key to the City” and a Wikipedia description, is a town of fewer than 20,000 residents and smaller than 12 square miles, located adjacent to another small but more famous town, Panama City. The difference is that Lynn Haven was founded by veterans who fought for the Union in the American Civil War. It all began when W.H. Lynn, editor of the GAR (Grand Army of the Republic) National Tribune donated land for a town hall and monument to all Union veterans. This is the only such monument that exists in the American South and is featured in Ripley’s Believe it or Not. 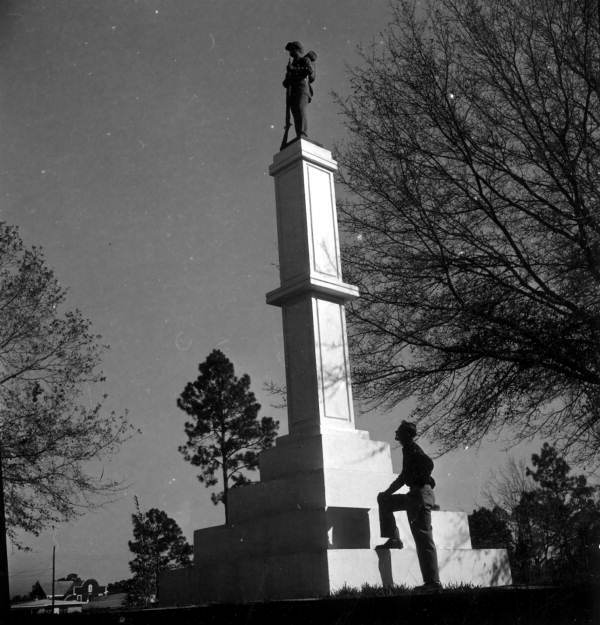 Erected in 1920 through small portions of Union soldiers’ pensions, the monument features a statue of a soldier holding a musket, 40-feet above the ground on a pedestal, facing north. 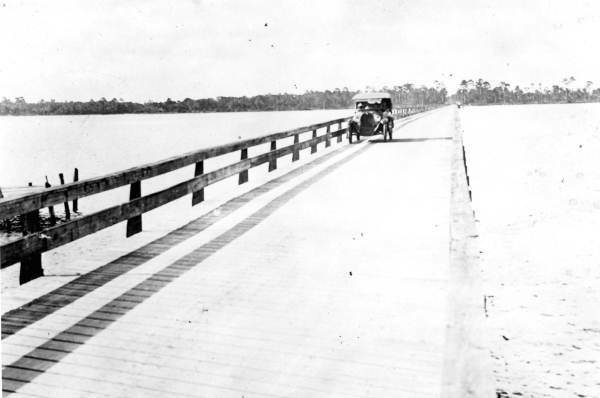 Robert perhaps subscribed to the GAR National Tribune and donated to the memorial, but most incredibly, he strongly wanted to be in Lynn Haven when the planning was taking place. He was not above investing in the real estate market there as the aging Union soldiers went south to retire. Such was the passion of this Pennsylvania Volunteer with the 6th Infantry, Company A Heavy Artillery who had guarded Washington D.C. during the final year of the war. In future articles we’ll find that Robert also lived and invested in another Florida town dedicated to Union veterans of the Civil War, St. Cloud, just south of Orlando. Getting back to the letter of 1913, Robert’s writing style is large, bold, and easy to read. But what first jumps out of the sentences are the frequent absence of subjects in the form of nouns and pronouns. I referred this as “postcard style” in an earlier article. It saves space and gets right to the point. He opens this letter saying, “Was sorry to hear . . .” and “Can sympathize with you . . .” Robert also likes to use ampersands, “&,” instead of writing out the conjunction “and.” This style seems to match his no-nonsense world view and conservative approach to life, not at all uncommon among his Scots-Irish ancestors who had settled Western Pennsylvania in the late 18th century. To his credit, there are very few spelling or grammatical errors. This nearly 70-year old farmer has apparently remembered his early English classes and, unlike today, is not afraid to communicate using the written word. This brings us to what I believe is the general purpose of the letter. First, it is written to his daughter, Edna “Janet” Jeannette (1887-1980), who would have been 26-years old at the time and had married Howard Kellar. Janet was also the recipient of a series of postcards written by Annie (1850-1922), Robert’s wife, while in institutional rehabilitation several years earlier. Janet was the oldest of the Gray children and the only surviving female. In this letter, Robert is expressing his profound grief at the loss of what was possibly his first grandchild, although his son Russell Stanley and wife Elmira had a daughter the same year as the letter and named her after grandma. Janet and Howard’s second child was born the next year and named Edna Roberta. While Robert never says, “I’m sorry for your loss,” he says that he’s sorry that Janet had no picture of the baby. Does this reveal how difficult it is sometimes for men to express their emotions? He seems to redeem himself by saying, “[I] can sympathize with you & your husband in your affliction.” Robert is remembering the tragic death of his first born at only 10 months of age, who would have been Janet’s older sister, Mary Bryce (1885-1886). He further consols Janet by voicing his pleasure that she has such a wonderful husband, comfortable home, and good health. But, perhaps most importantly, Robert testifies to his strong Christian faith: We must not think too much of our affliction & more of the infinite blessings bestowed on us by our heavenly Father. In the days before telephones and e-mail, the news that Robert received over a century ago from the home front 1,000 miles away surely came as a shock. Filled with sadness and disappointment, Great-grandfather Robert, referring to Janet’s postal announcement, at first must have been at a loss for words. He simply begins, “Yours received and noted.” What followed in the letter must have been received with gratitude by Janet and husband Howard. I’m certain that everyone in the family wished their father was back home, especially his wife, Annie. But, under the circumstances, it must have been good to hear that their dad was “well & thankful for the great blessing of health.” Next in our series is a letter dated 1914 from Robert in Florida to wife Annie in Pennsylvania. Although short and business-like, nevertheless it is communication, and we want to believe that other, more tender letters were written but are simply not in our possession. Stay tuned as our research, transcriptions, and postings continue.